Snapshot: 12w08a brings us a few nice things a few things I'm not so sure about and a few things I just hope Mojang doesn't incorporate into the next official update. First thing I like is UPSIDE DOWN STAIRS!!!!! Finally jeshhh. If you target the underside of a block you can now add an inverted stair. This will smooth out regular stairs and should make for some very interesting building designs in the upcoming future, smoother arches, rounder windows, crown moldings the list goes on. Jeb released a sneak peak picture. Mojang has also added what they want to call obese slimes. They seem like the huge slimes to me but now they will actually spawn in game. Bigger slimes means more slime balls so I'm happy with this as well. In the Flip side of adding Obese slimes is the Iron Golem. The golem is meant to defend villages from the zombie hordes. Not sure what to think of these guys yet. 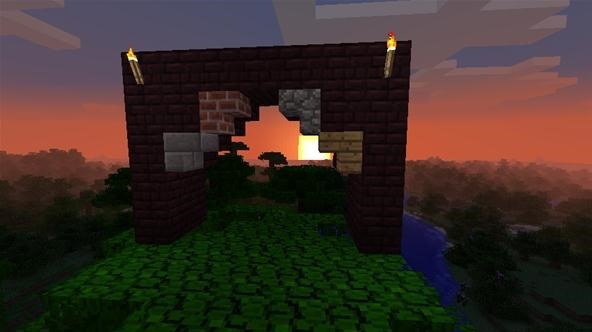 They are three blocks high so have trouble fitting under some roofs in villages thus zombies are able to break down a door and still get the villagers. They also look like a grey hulk version of the Testificates. Green vines with small rose buds running down its body and long stiff arms. In a cute moment I witnessed an Iron Golem giving one of the Testificates a rose. Now these golems aren't all hippies and flower children, They do flip the zombies around like flapjacks which can be humorous. Not sure yet if zombies run from the golems or they are running to the villagers more testing is needed. Golems spawn in villages and can be created much like snowmen as well. Vines spawn and grow in jungle biome caves. I like this adds a little variety. The cave generation and lighting issues that were broken in last weeks snapshot are now supposed to be fixed. The end is generating properly as well. One of the things I'm not happy about is the spawn rate of blacksmiths in villages. The rate has been reduced and I can only hope it is a bug. Not going to go off on this because like I said I hope this is not intentional. There is a bit more to this Snapshot but these are the main elements. Some bug fixes, some new bugs, UPSIDE DOWN STAIRS...Wait I already mentioned them didn't I. But I guess that's the idea. Whisper something into Mojang's ear enough and hopefully they will listen. Can't wait for 1.2 to come out. So many new additions...Makes me a bit giddy. See ya next week. Wooo!! I read about the snapshot earlier but was waiting for one of my favorite YouTuber's to make a video before I posted. I'm so, so excited and happy they added the stairs and the Village defense "system." I noticed some villages didn't even have any blacksmiths in it, so I really hope that's a bug as well. Great post, good to see someone here is as excited for 1.2 as I am!!!! Leinad must be having SOOO much fun with the stairs! I'v seen his love with stair designs. I have a pic of a golem but I can't post it for some reason. but trust be it's BAD! and COOL!